This artwork displays some of Intel's most important first computer chips: the 4004 4-bit microprocessor, the 8008 8-bit microprocessor, the 8080 8-bit microprocessor, the 3101 64-bit solid state memory chip, and the 1702 2K EPROM. Intel has had many firsts since its beginnings in 1968. However, these five early chips have captured the imaginations of many chip collectors. In the display, each of the images of the chips is proportionate to the others. The magnification factor is about 550 times. It is difficult to understand the importance of these chips in todays world of billions of instruction cycles and bytes of memory. Its difficult to think of a world where 64 bits of memory was a big deal. With USB memory sticks being almost disposable, an Erasable Programmable Read Only Memory chip seems like no big deal. It is hard to believe that Intel was a memory company for its first 10 years; microprocessors were an afterthought. Its hard to imagine engineers needing to be convinced of the value of the microprocessor. But we had to start somewhere and each of these chips was a revolution in its day. Each of the chips are Intel and fully functional. Here is a list of the microprocessors and memory used in this piece: Intel P4004, D8008, P8080A, P3101A, and C1702A. The artwork is framed in an 8"x8"x1.25 black shadow box frame, with glass. All framing materials are acid free. A narrative about the artwork that includes the artists signature is placed on the back of the artwork. Want to see more ChipScapes? Computer chips start out as ordinary sand, which is silicon dioxide. However, the silicon must be made very, very pure. The first step is to melt the sand, in a furnace that reaches about 3200. F, and mix with carbon. This first purification process creates 99% pure Silicon, a common output is Silicon Carbide. The Silicon Carbide is processed in a trichlorosilane distillation method to create 99.9999% pure silicon called polycrystalline silicon. The polysilicon is broken up into chunks. These chunks are melted in a crucible at about 2500. A silicon crystal seed is dipped in molten silicon and slowly drawn out to create a cylinder of silicon. These silicon cylinders are some of the purest crystals on the planet. Once the silicon cylinder is grown to the desired diameter, it is sawed into wafers. These wafers are polished to achieve a very flat mirror surface. 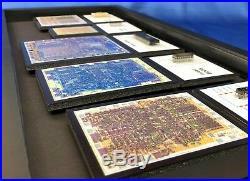 Transistors, and other micro-electronic parts, are built on the polished wafer in layers in a process called etching. The wafer is then sawed into its individual chips. Each chip is mounted in an electronic package that serves to protect it and connect it to the outside world. It has been said that computer chips are the greatest value added product in the world. We essentially take a pile of sand and change it into thousands of dollars worth of computer chips. These artworks are the creation of ChipScapes. Chips like the Intel 4004, MOS 6502, Zilog Z80, AMD 2901, IBM PowerPC and others have changed the way people work and play. Are dedicated to preserving and sharing these computing and communication technologies that changed the world. Artworks are fine collectible artworks. Come is a variety of shapes sizes and colors. Clusters of my artwork make for stunning displays! Would make a great gift for the nerd, geek, engineer, programmer, IT executive, or just that technology savvy person in your life. If you are interested in art on a subject or chip that you don't see listed, please message me. I have hundreds of artwork and cannot keep them all listed. Also, I do custom artworks. If I think it will be of general interest, the pricing will be similar to what you see in my store. If it is very specific to your interests the pricing will be higher, since I can't spread the development costs over multiple sales. For more information about ChipScapes. Please check out my ChipScapes. For more information about chip collecting as a hobby. The item "Intel's Firsts Chips that Changed the World (4004,8008,8080,3101,1702)" is in sale since Saturday, February 2, 2019. This item is in the category "Art\Mixed Media Art & Collage Art". The seller is "chipscapes" and is located in Winter Park, Florida. Size: Medium (Up to 30in.